Globe-trotting exhibit shows portraits of local survivors at S.F. 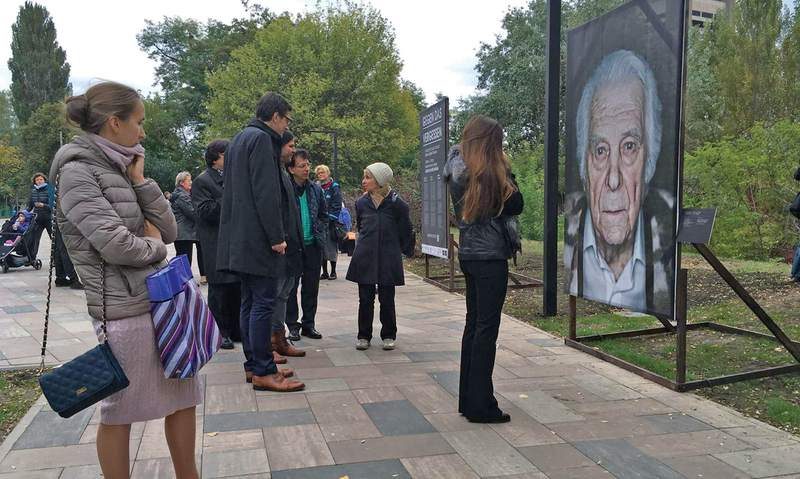 Civic Center – J.
Luigi Toscano's traveling exhibit, seen here in Ukraine, displays portraits of Holocaust survivors who live in the place where the exhibit is on display. When San Francisco resident Anne Marie Yellin, 90, opened the door to her visitor, it took her only a moment to switch into a fast-paced, accented German. While Yellin has been living in California for over 70 years, German is the Holocaust survivor’s first language; she lived through Kristallnacht and was a “hidden child” in Belgium. And it was her past that had brought German photographer Luigi Toscano there — to take her picture for his upcoming outdoor show of large-scale portraits of living Holocaust survivors. The show, “Lest We Forget,” will take place outside San Francisco’s City Hall from April 15 to May 20. “Lest We Forget” (“Gegen das Vergessen”) is an ongoing project that, from humble beginnings in Toscano’s native city of Mannheim, Germany, has grown into an international traveling exhibit in which Toscano photographs local survivors and displays their portraits alongside others in public spaces. It’s become a mission for Toscano, and also an unexpected success. Four years ago, the project was just a dream. Back then, he said, nobody believed in him or would give him money. Now Toscano has had 10 shows in nine cities, including in Germany, Ukraine, Israel and Russia. In the U.S., “Lest We Forget” has visited Boston, the United Nations headquarters in New York City and Washington, D.C., where 200 of the enormous portraits lined the National Mall last year. In San Francisco, around 80 of the large-format photos — roughly 60 by 88 inches — will line the paths of Civic Center Plaza, including the photo of Yellin. Luigi Toscano during photo session with local Holocaust survivor Anne Marie Yellin. Making the portraits isn’t a simple process. After taking the intimate photographs, in which subjects’ faces are starkly illuminated against a black background to show every detail, Toscano color-corrects them back in Germany. 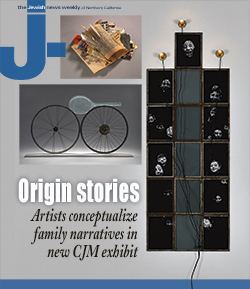 They are printed in New Jersey, and then he assembles them on wood frames in Pittsburgh. He’ll drive the Bay Area photos from Pittsburgh to San Francisco himself, in a truck with large anti-hate messages on its side and a place for people to sign in support. “For me, it’s important to spell out my message, and it’s definitely against anti-Semitism, against racism and against any kind of hatred,” Toscano said. Yellin was happy to participate in Toscano’s project, as speaking up against hatred and racism is something that still motivates her to speak at schools and share her story, which she’ll do as long as she is able. Born in 1928, the native of Chemnitz, Germany, remembers the breaking of glass during Kristallnacht and, as a child, asking her father what it was. And she remembers her father being taken to Buchenwald and the fake papers her mother used to get him out. The family escaped to Belgium, where they lived as refugees in cramped quarters. But that was only a temporary respite; when the Germans invaded, Yellin survived by hiding in plain sight in a convent school. In 1948, through an aunt who lived in San Francisco, she and her father were able to come to the U.S. (Yellin’s mother died during the war from a stroke). Toscano listened soberly to Yellin’s story before taking her photo — one of 17 that he would take during his time in San Francisco. The exhibit at Civic Center was organized by cultural center Goethe-Institut San Francisco and the German Consulate. In conjunction with the exhibit, the center, with ADL and the Israeli consulate, is also hosting a panel talk on May 13 on the recent rise of global anti-Semitism. 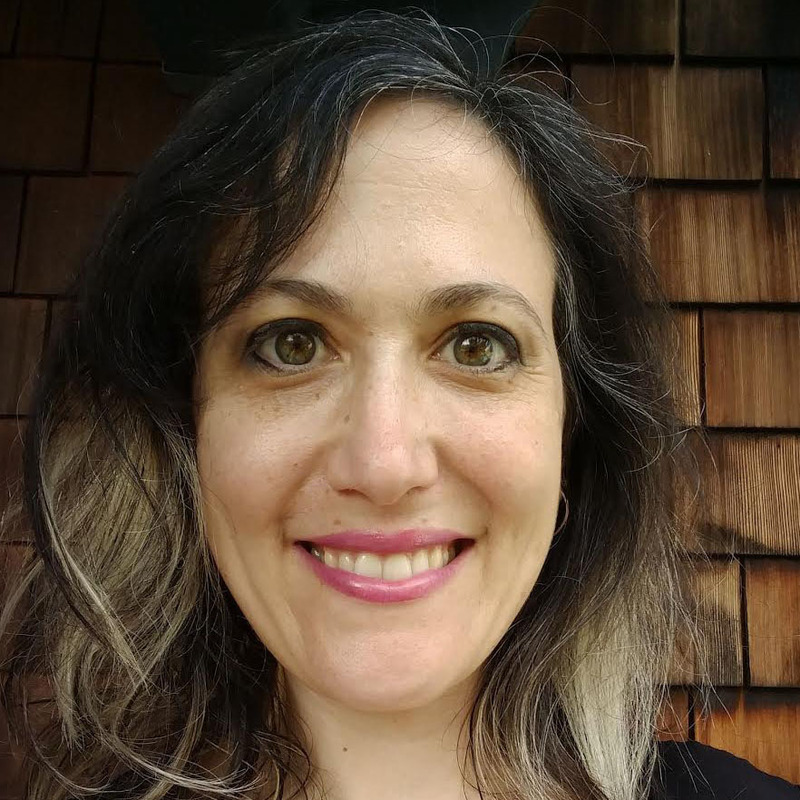 They are also sponsoring a series of films at noon every Thursday in May, at the main branch of the San Francisco Pubic Library, including a documentary on Toscano’s project. 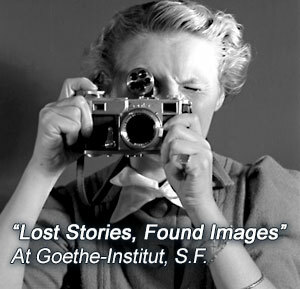 The photographer will attend an earlier screening of that film April 30, 6-8 p.m., at the Goethe-Institut. All events are free. For Toscano, what began as a small project has turned into an endeavor that has made the lives of countless Holocaust survivors visible to the general public. The son of Italian immigrants to Germany, Toscano is not Jewish, but for him the project transcends ethnic identity to reach the depth of moral urgency.